In a recent post, Jack Wallen explained how to make Ethernet cable connections. In the ensuing comments, I noticed some interest in Ethernet cabling itself. That's understandable, Ethernet cabling does not look or act like normal wiring. The greater the difference between the input pulses, the larger the output pulse, making it easier for the receiver logic to differentiate ones and zeros. I might add that this becomes more important as throughput rates increase. As you can see in the slide, differential signaling has some noise-canceling capability, but not enough when it comes to Ethernet cabling. That's because two types of interference come into play, electromagnetic radiation from sources such as power wires or crosstalk from other pairs in the same cable. Both introduce noise that reduces the differential. If there is enough noise, the receiver can misread what was sent. The Ethernet cabling most of us are familiar with consists of four pairs of wires, twisted together, and enclosed in a single insulating cover jacket. Those twists are a pain when making connections, but are there for a reason. Transmitting Ethernet signals over a cable that small would not be possible without them. To understand the importance of twisting the wires requires learning about common-mode rejection. It seems that digital electronics connected with balanced lines, such as twisted pair Ethernet cabling are capable of rejecting noise, as long as the spurious emission is common to both leads in the twisted pair. It might help to use an example. I mentioned crosstalk earlier. 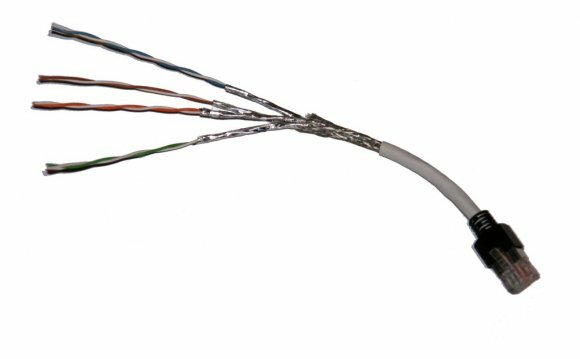 If pairs were not twisted in Ethernet cabling, it is entirely possible for two wires in adjacent pairs to be next to each other for the entire length of the cable. That could skew the results by adding cross talk to only one leg of the pairing. If the wires in the pair were twisted, both wires in the pair would be affected the same. Then the receiver using common-mode rejection would be able to filter out the crosstalk interference.